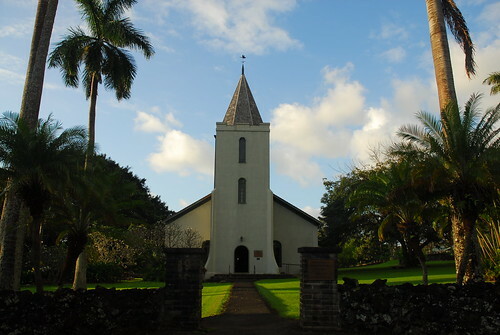 Historic Maui Church, originally uploaded by phaelosopher. Our disconnectedness with self… is the same as our sense of separateness from God. It leads us to believe that nothing we do matters. It allows us to justify choices and actions that perpetuate discordancy. An extreme example of discordancy is war. War is one of the things we focus much of our attention on to be ended, but war is not the “worst” thing we can do. The worst thing we can do, being who we are, is to fear. In fact, the worse we can be, is fearful, for to be fearful is to be in a state of dis-ease, which creates an energetic pattern around which kindred experiences — spiritual, mental, and physical — can potentially form. We live in fear, and are susceptible to the drain that it can have upon the human spirit far more than we wage the kind of war that most of us are seeking peace from. However, the most long-lasting and ongoing war that we wage, is with self; which in its own right, is a war with God. It’s a war we can’t “win,” not because God is so mighty (God is), but because we are “extensions” and expressions of God. Anything that we do “against” another, will manifest — one way or another, one time or another, one space or another — “against” us… not as “punishment,” but balance. As such, we need to come to terms with self, and sit at the table of Truth to sign a “Treaty of Love”. Doing so, and being so, will change our lives. The concept of “yin” and “yang” are not about “opposite” forces coming together to make a whole; it is about complementary powers that are unified in balance. The “masculine” and “feminine” aspects of consciousness are not “opposites.” They are not opposing forces. They are complementary powers that each have a place and purpose in the Grand Creative Scheme. Every man has a feminine aspect, and every woman has a masculine one. And that which we call God represents both masculine and feminine, “positive” and “negative,” “outgoing and inflowing,” in Unity and Balance. God is Unity and balance; God and Goddess… you and me. God is All… and Allah… and Nothing. All includes somethingness and nothingness. There is nothing that is not God/Goddess, but there appears to be much that is neither… including us. And there’s our conundrum. We don’t think we’re expressions of God. We question our power, doubt or deny that it is meaningful, or fear it. We may think that we are expressions of God, but someone else isn’t… or that someone else thinks they are, but are not, and they think that we’re not. The common denominator in such thinking, is duality, which takes many forms, and begets not only separative thinking, but linear as well. Separative thinking and perception fosters our proclivity to be comparative. It makes us see ideas, things, and people in terms of likeness and unlikeness. We then judge those others accordingly, looking and acting more favorably to those that appear to be “like” us, and less favorably to those that appear to be “unlike” us. And of course, the more that we allow ourselves to be guided by fear, the more extreme our judgment, even to the point that unlikeness becomes dislike, and then hostility. All of these expressions are energetic drains, especially since they are founded upon an untruth… that we are separate from, and unlike each other, and from God. Linear thinking fosters our proclivity to take ourselves out of the Now, where our power can be utilized to our benefit, to a “when” where it cannot. By being angry over the past, or worrying about a perceived future event, we pass up the Grand Ppportunity of the lifetime. What is that, you ask? Of being present Now, in the Moment, in balance, in love, and peace with Self. Being so centered allows Clear Sight. While most people recognize the term as the definition of the meaning of clairvoyance, I’m referring to something more basic. Being balanced and centered in the moment… in the present, allows the True Presence that is you, that is God, to be experienced, felt, and heard. Do you want to know what you should do now? Or where you should go now? Be present. Be centered. Be loving, knowing that you are at peace now. Then ask your question and be willing to accept the answer, and follow the guidance that you receive. If you’re dealing with an illness or disease and are in pain, linear thinking, combined with the vestiges of fear, would suggest that it will take a period of time find a “cure,” if you believe that a cure can be found at all. Our medical system would have you believe that “cures” are only possible through pharmaceuticals, and that doctors orders can supersede the orders of your heart and soul. Neither is true, but you can give such ideas power through your belief. Politicians are given power if we accept the untruths that they feed us, as truth. Their power is taken away when we are balanced and centered in the heart, know our own peaceful truth, and refuse to give our energy to perpetuating fear. Even if someone else tries to perpetuate fear against us, we need not fear them, or the idea that they perpetuate, if we know who we are, and embrace the full spectrum of our beingness, which comes when our eyes and heart open to the complementary principles that govern, and have always governed, all human experience. There was this King who ruled his kingdom for many years. His every desire was satisfied, but still he felt there must be more to life than just satisfying ones instincts. He wanted to experience God – know who he was. He asked his courtiers to find God for him, but none of them could help him. He had heard about a shepherd boy named David who seemed content with his lot. He called him to his palace and asked him, “Where is God, I want to experience, God”. David took him out to the fields and asked the King could he see God. The king said, “No, where is God”? David said that he is up in the air, all around him. But still the King could not understand or experience, God. David took him to a well and said that God was in the well. The King looked at David and said, “In the well, God is in the well! !” David asked the King to look in the well and the King obliged. He then said, “All I can see is water and my image”! David said to the King, “You have found God”! You and I are the image of God. Can you see God when you look in a mirror? The kingdom of God is within you!! Neither shall they say, Lo here! Or, lo there! For, behold, the kingdom of God is within you [Luke 17: 21]. George: Great insights. Thank you for sharing! Thoughts on God is a very interesting one.The principle of complimentarity seems to represent African approach to reality where being is defined not in the Aristotlian sense of being qua being but being as belonging.Being always belongs,it always relates to other beings both above and below it.Being can only be justified in the light of its ultimate justification.